It’s everywhere. Can’t run, can’t hide from the roar of falling towers, and the smoky horizon of powdered people, weak with panic; bracing themselves for what was to come. 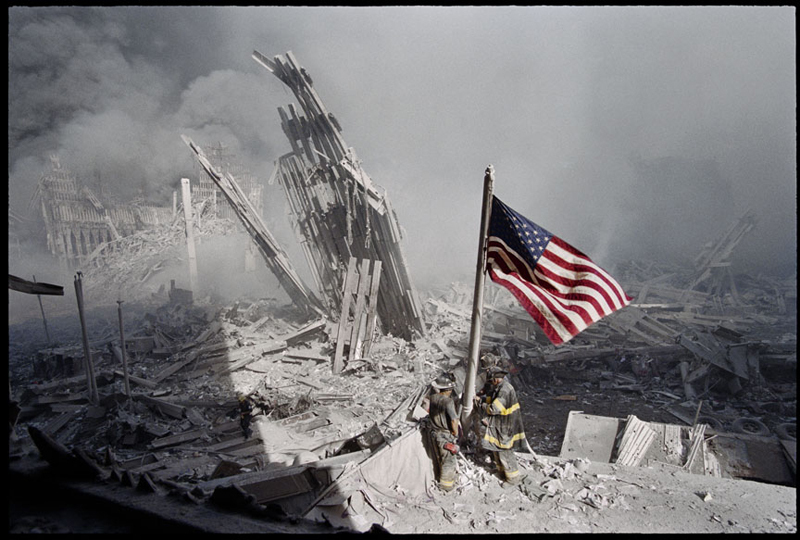 2,996 lives were stolen on September 11th 2001. 10 years on and the anniversary is marked by thrusting the event back into national consciousness. The images brazen across the news incapsulate the dread of that frightful day and indeed, we must never forget the evil that fell upon New York in those hours. But evil is seemingly contagious. We must be realistic and have integrity to oppose all evil, not just that which hurts western societies. And as we point the fingers of fault, we find hypocrites and liars. In the few minutes it took Bush to declare war he said one haunting sentence, that finds us in agreement for the first time. “Our war on terror begins with Al-Qaeda but does not end there”. That is certainly true. The Iraq Body Count (IBC) calculates that 92,614 Iraqi civilians were killed by armed violence between 2003 and 2008. In comparison, antiwar.com reports the American death total to be 4474. General Tommy Franks is infamous for his dismissive “we don’t do body counts” and indeed, there is much speculation that despite the estimates of millions of Iraqi deaths, the exact figure is difficult to pinpoint. It really highlights the difference in the value of life. Whilst we can count and name the 2,996 innocent westerners that were killed in 9/11; we can’t even count the dead in Iraq. I am glad those in America were able to preserve their individuality, and be remembered as they really were. But this honour is rarely afforded to slain peoples around the world. My TV attempts to drone into my brain that 9/11 was the worst terrorist attack we have ever seen. But my eyes are open. As Lowkey reminds us, the definition of terrorism is ‘violent or destructive acts such as bombing, committed by groups in order to intimidate a population or Government, into granting their demands’. And recalling Bush’s own words, the demands of America were not negotiable, and thousands paid for it. So many gullibly regurgitate Bush and condemn 9/11 as ‘despicable acts of terror’. Whilst this absolutely true, what other possible words could be donned to define the genocide of the Iraqi people? It is a joke that he even had the audacity to proclaim ‘the US respects the people of Afghanistan, after all we are their largest source of humanitarian aid’. Perhaps we should be charitable and offer Bush a dictionary, because as far as I am aware, the murder of thousands of people does not equate to humanitarian aid. It is disturbing to watch an entire audience rise to a standing ovation 4 times to applaud the hypocrisy that so easily churns from Bush’s mouth. It is a double edged sword for he who recognises that by ‘aiding and abetting murder’ one is ‘committing murder’. As Lowkey goes on to explain ‘America inflicted a million Ground Zeros’, his words fall on deaf, or patriotic ears. We must ask ourselves why the majority of those so readily compassionate for the Americans have a heart of cold apathy for those who die at the hands of the ‘heroes’ they weep for. 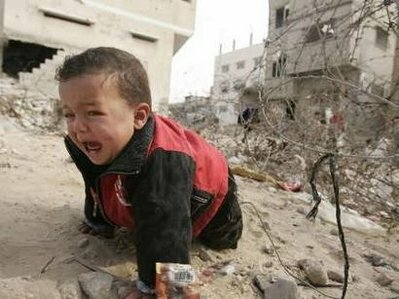 Why are no tears shed for the 1,387 Palestinians who were killed in the 2009 attack on Gaza? As Israel continues it’s ethnic cleansing and apartheid, the BBC censors the very utterance of ‘Palestine’ from the airwaves. We buy into our own ignorance, dismiss the struggles of peoples all over this globe, and then don’t think to question why there are even terrorist attacks in the first place. The ‘quiet, unyielding anger’ of the American people was not limited to them. America reacted to it’s attack by bombing innocent people and slurring the muslim community as it’s justification. Sometimes I think the only difference between Obama, Bush and the terrorists they despiese is the wage packet. We actually pay these ‘representatives’ to fight wars in our name. And the benefit? It shouldn’t need to be pointed out that there are advantages to reminding people of 9/11. The coverage is moralistic and void of political context. In the last 10 years, we cannot deny that the racism and persecution of muslims has shot up faster than US bullets. Islam is repeatedly the scapegoat for political terrorism, on every which side. An easy example is this. Whenever we discuss the conflict between Israel and Palestine, liberals insist on behalf of the left wing of Israel, and that there are Israeli anti-occupation activists. I am not disputing this. What irritates me is that we jump to make this distinction before we condemn the actions of the Israeli state, and defend the Palestinians. But whenever Gaza is mentioned, it seems these same liberals are faster to cry ‘Hamas’ than ‘liberation’. The moral of my rant is that it is hypocritical but also insincere to show compassion for the victims of 9/11, and yet make no protest against similar terrorism all over the world. Showing solidarity with Iraqi civilians does not amount to support for Al-Qaeda. The people of Afghanistan are distinct from the members of the Taliban regime, and seeking the freedom of Palestine does not automatically cost the price of a Hamas membership card. Oppose evil in every suit you find for peace will never be found in vanity. ~ by Bobi Pasquale on September 10, 2011.